A marketing agreement will see the Besser Co. sales organization promote the Rosetta Hardscapes product line to domestic and international prospects, augmenting the latter company’s sales efforts. The variety of Rosetta units and plant equipment offerings, Besser officials note, will appeal to producers throughout manufactured and ready mixed concrete. “Rosetta enjoys a unique niche in the marketplace with wet cast products that look like authentic natural stone. 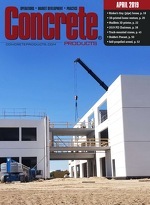 We’re looking forward to showing our customers and prospects how cost-effectively they can complement their existing dry cast products and expand into new markets by adding these distinctive concrete units to their product line,” says Besser Director of International Sales and Applications Engineering Duane Rondeau. Like Besser, Rosetta Hardscapes is based in northern Michigan; both cite commitment to continuous research & development and one-stop solutions. Besser specializes in production systems, molds and services for manufactured concrete, and has equipment running in 130 countries. Rosetta provides solutions for hardscape projects that require coordinating elements, and is represented through concrete producers in the U.S., Canada, Germany, the Middle East and Korea, and are ever expanding their international presence. To step up service to the Dakotas market, Lafarge North America is investing in a concrete dome cement storage facility and terminal on a new rail spur on the east side of Williston, N.D.—in conjunction with the East Valley Rail project of developer New Frontier LLC. The facility will support 30,000 tons of cement storage, transferring product more efficiently into the area and strengthening the company’s network of Dakota terminals and Bakken area presence. Beyond conventional concrete applications, Lafarge cement is used in the Dakotas to support the oil and gas industry with soil stabilization for roads and extraction sites, plus well drilling. “This facility allows [us] to support the Dakotas in a sustainable manner in terms of a permanent solution and one that relieves truck traffic from the heavily trafficked Highway 2,” says Lafarge Dakotas General Manager Roy Sander. Indianola, Iowa, volumetric mixing equipment leader Cemen Tech Inc. has named Connor Deering president and chief executive officer, and Mark Rinehart director of Sales & Marketing. Rinehart was most recently director of Technology for Ziegler Caterpillar and, according to Deering, “has been instrumental in the advancement of the technology offered on Cemen Tech’s mixers.” The manufacturer introduced the C860 at the World of Concrete in early February. The model offers GPS tracking and a new electronic control panel that will allow those in the field the ability to track the volumetric mixers’ exact flow of admixtures and water electronically. Louisville, Ky.-based coal combustion products (CCP) processing and management specialist Charah Inc. has entered into an agreement covering output from the Brame Energy Center facilities in Lena, La., owned by Cleco Power LLC. Charah will sell high quality, ASTM C618 C-grade fly ash, bottom ash and circulating fluidized bed ashes from the power station to ready mixed concrete producers and other end users throughout the region, and provide routine ash landfill operations for any unsold CCP. The circulating fluidized bed ashes generated will also be beneficially reused in certain market segments, including oil field and manufactured aggregate. Daimler Trucks North America plans to sharply increase production and employment levels at its Mt. Holly, N.C., truck manufacturing plant through mid-summer, adding a third shift and filling an additional 580 manufacturing and 25 related supervision, engineering and administrative positions by mid-July. The Mt. Holly plant manufactures Freightliner M2 Business Class medium-duty diesel and natural gas-powered trucks, plus an extensive line of 114SD and 108SD models for the severe-duty vocational truck markets. A strategic partnership between Cummins Inc. and Santa Ana, Calif.-based Agility Fuel Systems, a leader in natural gas fuel storage and delivery systems for heavy-duty trucks, is intended to drive adoption of the diesel fuel alternative. The partnership includes technology development and integration of software and hardware between the natural gas engine and onboard fuel storage and delivery system. Additionally, Agility and Cummins will integrate their sales and aftermarket support and distribution networks to further enhance the end-user experience. Customers will soon be able to have service performed and obtain replacement parts for their natural gas-powered equipment at authorized Cummins distributor and OEM truck dealer locations in the U.S. and Canada. “Our goal has always been to deliver a diesel-like experience to the end user, making natural gas-powered vehicles as easy to operate and service as diesel vehicles. This partnership with Cummins is a key enabler. By co-developing differentiated and improved natural gas solutions, and utilizing the breadth of Cummins service network, we believe we can accelerate the adoption of natural gas as a fuel for more vehicles, including heavy duty trucks,” says Agility CEO Barry Engle, adding that terms of the agreement include a Cummins equity investment in his company. Oklahoma-based Hilti, Inc. has been recognized as one of this year’s Best Workplaces and ranks 89 on the 2015 Fortune “100 Best Companies to Work For.” A selection process created by Great Place to Work includes an employee survey and an in-depth questionnaire about the company programs and practices. Great Place to Work then evaluates each application using a unique methodology based on five dimensions: credibility, respect, fairness, pride and camaraderie. Hilti was also recognized with a “Great Rated!” designation, highlighting what makes the workplace culture great in areas like professional development and training, company atmosphere, benefits and rewards. American Infrastructure, Allan A. Myers and Independence Construction Materials have unified under the Allan Myers banner, reflective of the original father and son team that founded the Worcester, Pa., business more than 75 years ago. The three companies known for heavy civil construction and materials production have combined to make the largest organization of its kind in the region. Allan Myers has been responsible for creating the roads, bridges, treatment plants, residential, and commercial developments and pipelines that connect communities to services, clean water, and each other, he adds. The company will continue to employ more than 2,000 individuals, dispatched to projects sites in Pennsylvania, Delaware, District of Columbia, Maryland and Virginia. Bloomington, Minn.-based Capital Safety, whose brands include DBI-Sala and Protecta, has acquired Python Safety Inc., a Woodstock, Ga., specialist in dropped object prevention solutions for tools and equipment. TNT Crane & Rigging, one of the nation’s premier lifting services providers, has acquired Rocky Mountain Structures and its subsidiaries. Denver-based RMS is one of the largest crane and rigging services companies in the Rocky Mountain region, serving Colorado and the surrounding states. Founded in 1977, it has longstanding ties to the area and a well-diversified customer base which make the business a natural strategic fit for TNT. The acquisition expands TNT’s contiguous geographic coverage, end-market exposure and fleet composition with the addition of three Colorado branches and 66 cranes. RMS serves the power, commercial and construction markets as well as other end markets throughout the Rocky Mountain Region. “RMS provides further geographic expansion in the western U.S. as well as end market diversification through Colorado’s broad group of industry sectors,” adds TNT CEO Mike Appling. “The depth and breadth of our combined capabilities and experience is a tremendous benefit to all of our customers.” With the addition of RMS, he notes, TNT has 1,500-plus employees in 38 locations and a fleet of more than 620 hydraulic truck, all terrain and crawler cranes, plus a comprehensive inventory of gantry jacks, forklifts, rigging equipment, and tractor/trailers. Ron Blank & Associates, Inc. has launched a comprehensive program to help building product manufacturers in the era of the U.S. Green Building Council LEED v4 rating system. “The industry has changed significantly over the past decade. Building product manufacturers are under the gun to get their products specified in a highly fragmented marketplace. Architects are requesting Health Product Declarations (HPDs), LEED v4 product documentation, and up-to-date guide specs in order to specify building products. Manufacturers don’t always have specialists in house to develop this crucial documentation,” says Ron Blank. The cornerstone of the firm’s marketing package is the architectural specifications program, featuring a team of architects who deliver proprietary building product presentations to the top design firms in the country. The presentations increase brand recognition for the manufacturer and help get their building products specified. To help customers maximize the use and productivity of their owned equipment, Caterpillar Inc. is entering an agreement with Yard Club, a San Francisco-based startup that has developed an online peer-to-peer equipment rental platform. Caterpillar has provided strategic financing to Yard Club, and will launch the online ordering platform in specific metropolitan markets in conjunction with U.S. and Canadian Caterpillar dealers. The platform will include Cat and other brands of rolling stock. Since its founding in 2013, Yard Club has focused on San Francisco Bay Area contractors; with Caterpillar’s investment, the business is poised to further develop the rental platform and expand club member covers. Yard Club expects to have dealer and customer fleets installed on the platform and ready for rental by midyear. Hardscape tool, equipment and supply specialist PaveTech Inc. will hold a Mechanical Equipment Training for Permeable Interlocking Concrete Pavement session this month at the School for Advanced Segmental Paving. The Franksville, Wis., facility is billed as the world’s first vocational school offering hands-on, best practices training and education for hardscaping professionals. Organizers have enlisted top experts and manufacturer representatives to cover a two-day curriculum highlighted by Mechanical Laying & Screeding Training plus Best Practices for Site Layout, Compaction and Screeding tracks, to include insights on proportional lasers. Additional School for Advanced Segmental Paving course information can be obtained from PaveTech’s Sam Sabean, 952/226-6400; [email protected]; www.pavetech.com.